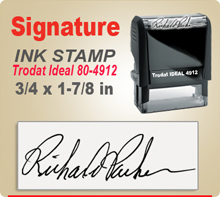 Signature Ink Stamps Online. Easy to order. Scan Signature. Upload as directed. 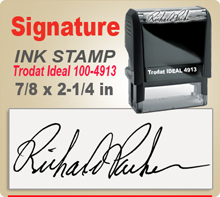 Signature Stamps in by 4 pm Central ship next day. 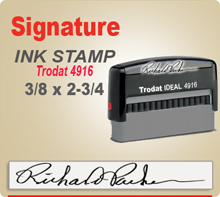 Trodat Ideal 100 4913, Trodat Ideal 200 4914, Trodat Ideal 80 4912 and Trodat Ideal 50 4911. 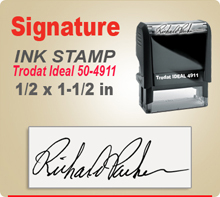 Not all signature stamps are created equal. 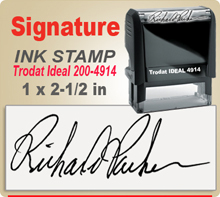 We've been making Ideal Signature Stamps since 1974. 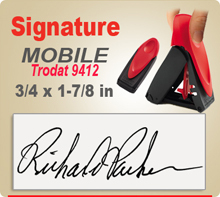 Let us make your quality signature Stamper today.